Now I understand why everyone is raving about Livery. It hit me right when I walked in the door. 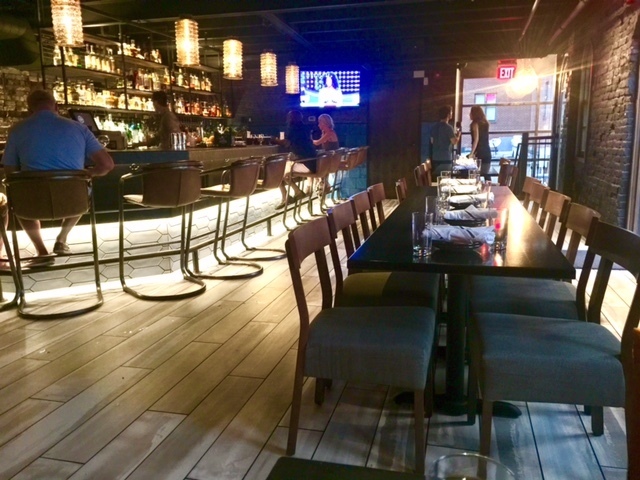 I was knocked off my feet by the ambience: low lighting, cozy and casual chic... with so many different directions to go in -- main level, upstairs, outdoors, even on the rooftop. I was excited just to see where we were going to sit, which was inside, upstairs, in a red leather semicircle booth by the bar. I would have never guessed by looking in from the outside, just how much space this restored 1890’s building that once stabled horses, has to offer. At the Latin-flair restaurant, found at 720 College Avenue, we ordered several of the tapas-style dishes. My first bite was into the cauliflower with shishito verde, pepitas, amarillo gastrique and fresnos. It was seasoned to perfection. My next bite was into the flavorful Brussels sprouts with cilantro, lime, and cotija. Livery cooks up a variety of empanadas, including chorizo, queso, steak, corn, chicken, and lamb. We tried the chicken with cotija and salsa verde, and the corn with cheddar and cilantro-jalapeño crema. Both were equally delicious, and made for a tasty combination of savory and sweet. Our next round was the skirt steak with chipotle dry rub, polenta, roasted carrots and chipotle butter. My friend got it rare, I ordered mine medium well, with shrimp. We both thought the steak was tender and juicy, and the shrimp made mine that much better. Have you visited Livery? Tweet me your thoughts and photos @ErickaFlye .